OK, so perhaps I am not the world’s most enthusiastic unpaid laborer, especially when it involves getting up at 6am on a Saturday. But I guess I was a teeny bit keen to take a glimpse behind the race curtain. I said teeny. 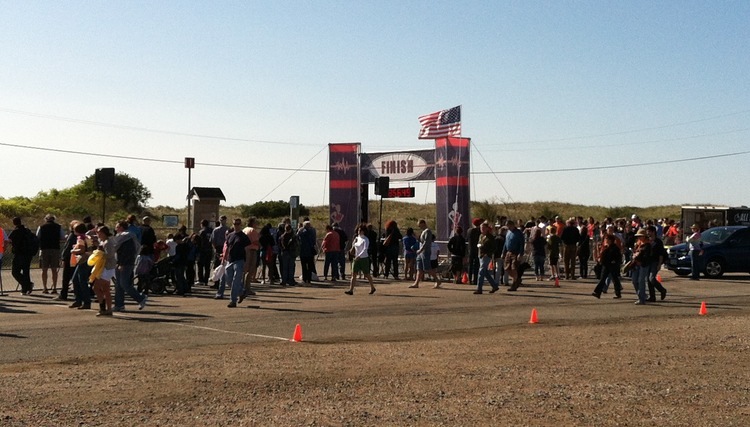 Runners gather for the Twin Lights Half. The beach is just beyond the grassy dunes. So I sent off my volunteer email and asked to be assigned to an intersection directing runners. I thought that would be fun, and I would be out there on a course looking dignified for a change (albeit in a bright orange vest). 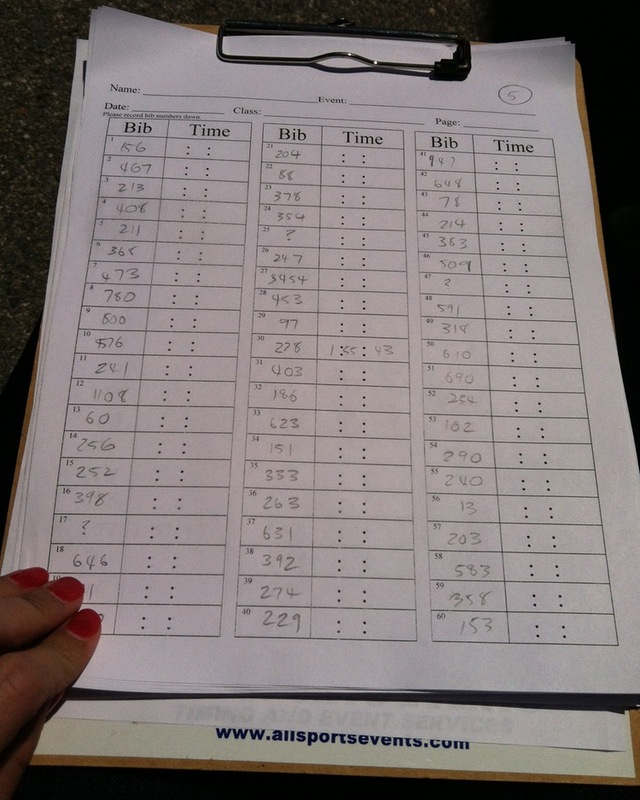 I also chose “timers,” but I secretly hoped the volunteer co-ordinator wouldn’t notice that. 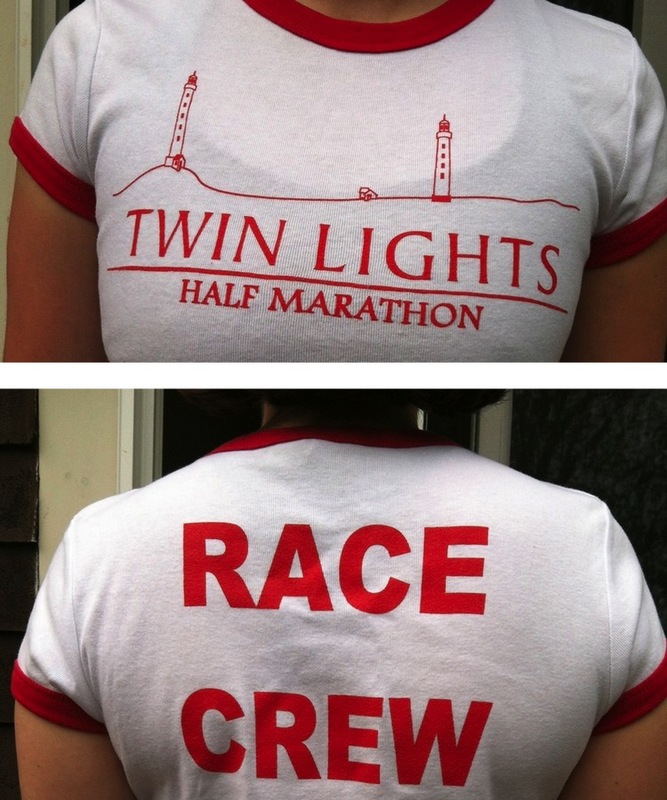 We arrived as things were kicking off, and I was issued my special “race crew” T-shirt. So far so good. I was then told that I should do … absolutely nothing. It was my worst volunteering fear realized. While the other beshirted folks were running around purposefully, handing out bibs and shirts and randomly folding and straightening things, I had no occupation whatsoever. Two runners eventually approached me to ask how many water stops there would be. Of course, I didn’t know. Finally, I was asked to fill in for one of the folks handing out the race tees. Naturally, by this stage many of the sizes people had requested were gone. Most of the runners took it in stride. Some, not so much. “Oh sure,” we said, looking at each other with fear in our eyes. “That sounds fine.” Quick, let’s escape to the beach and hope no one notices. 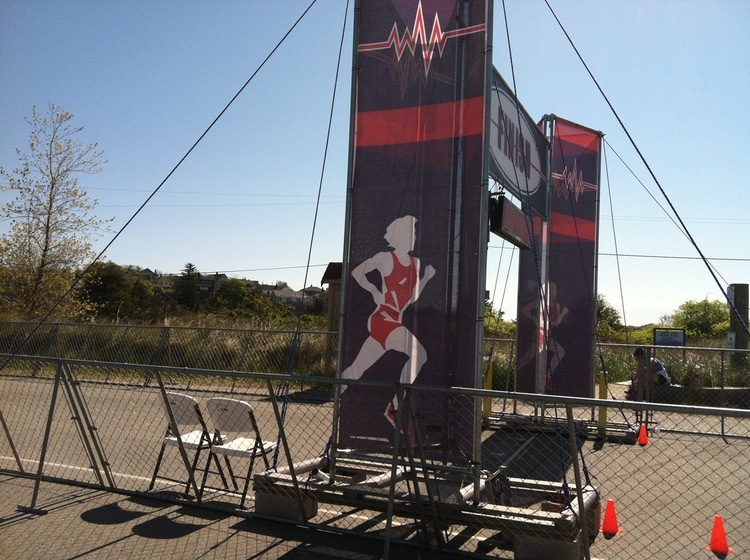 We were stationed on the two chairs to the left of the finish. We didn’t catch everyone, but that would have been impossible (especially for newbies like us). And after all, we were just a back-up back-up. I did gain a new appreciation for why race directors insist that people pin their bibs to their fronts. It was also remarkable how many people crossed the line without any bib at all. We did have a fantastic vantage point from which to witness the 1000 or so runners (and walkers) up close as they finished: limping, holding hands, high-fiving the crowd, despondent, triumphant, exhausted. It was a brilliant place to be at that moment. But it was a long, hot job. We were out in the blazing sun for two-and-a-half hours (it was a gorgeous day). When Hubby, who had impressively run the half, came over to say hi, we finally got something to eat (much appreciated pizza slice delivery). But we were effectively abandoned by the rest of the volunteering crew, who I guess had their hands full with baked goods and trash cans. We didn’t get a thank you on the day (but I suppose that’s what the T-shirt is for), although I did get a nice email from the co-ordinator. 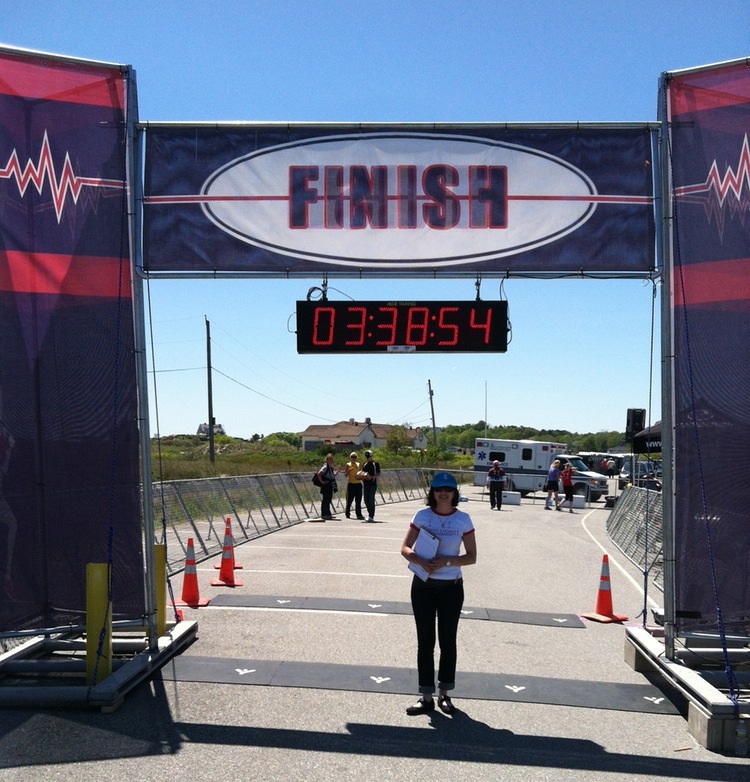 This entry was posted in Fitness, Humor, Running, Sports and tagged half-marathon, race volunteer, timing. Bookmark the permalink. Now if you ever have to organize a run, you’ll know how to keep your volunteers happy…feed them! Yes! Especially pizza. And maybe beer. I was SO worried I was going to be given nothing to do. It was almost pre-determined! Luckily it didn’t last too long. I was almost ready to cast off the shirt! You’re right about the humor; totally necessary in a situation like that. I try to thank as many volunteers as I can…..I can appreciate now truly what a THANKLESS job it truly is! I will make a goal to try to thank even more of them now!!! So will you be 13.1 ready for Disney??? ?